We are nearing the end of the 2018 Winter Olympics in PyeongChang, South Korea—and that means the last-ditch efforts to collect as many gold medals as possible is on for each country. There are a few notably exciting events (and podium places) up for grabs this weekend—including men’s team curling (an inexplicably entertaining crowd favorite event) and women’s snowboarding parallel giant slalom final (where legendary underdog Ester Ledecka could snag her second gold medal of the Games). These events are coming on the tail of some of the craziest moments of the Games—including America’s show-stealing gold medal win against Canada in the women’s hockey final. That impressive victory added to the United States’ eight gold medals and allowed the red, white, and blue to finally crack into the top four in total medal counts. Currently, Norway, Canada, and Germany are rounding out the top three in the medal count—with the Norwegian country pulling away from the rest of the world with a total of 37 medals—besting second place (Canada, with 27 medals) by ten pieces of hardware. Even if the U.S. were to win a medal in every final event we are competing in until the end of the games, it wouldn’t be enough to dethrone Norway from the top spot—as the US is holding tight with 21 medals at present. But that doesn’t mean there aren’t more golden moments to be had. The men’s team curling final, which will play Saturday at 3 a.m. EST, marks the first time in U.S. history that Team USA will be contending for the gold in this event. In the past two Winter Olympic Games (Vancouver and Sochi) Team USA placed last and next-to-last, respectively. On Friday at 7:30 a.m. EST, Joey Mantia, will be competing to take the top spot in the men’s mass start speed skating final. Mantia placed 8th in the men’s 1,500 meter earlier in the Games and is the reigning world champion in the men’s event—making his chances for ending his 2018 Winter Olympic performance on top of the podium. 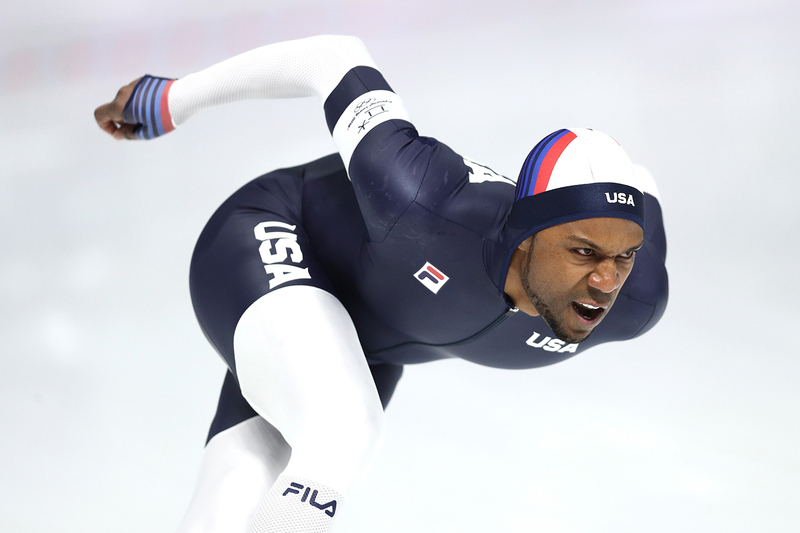 In other speed skating news, Shani Davis—the first black man to qualify for the U.S. Olympic speed skating team, seen above—will be competing in his swan song race: the men’s 1,000 meter race. Davis has won back-to-back gold medals in this event (in 2006 and 2010), and will be looking to end his career just as impressively as he started it. The event will show on Friday at 5 a.m. EST. Additionally, the women’s figure skating final will air Thursday at 8 p.m. EST, and the men’s snowboarding big air final will show Friday at 8 p.m. EST (which is probably the most feasible time on this list to actually tune in). There’s only three days left in the Olympics, and they’re bound to be interesting ones.